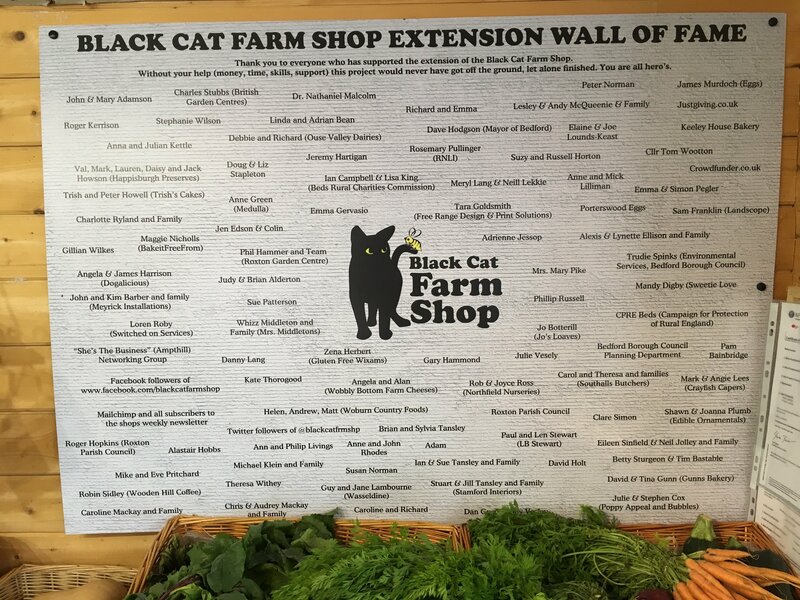 The Black Cat Farm Shop is expanding!. Whilst the shop worked fine in its old format, there was no room to expand, or to be able to make things on site (as there was no water or waste connected). The plan was to build another cabin to the right hand side, and connect the two. The new end will be set up as a cooking/preparation/storage area. This has now been done. This means that Sue will be able to make all the home-made preserves on site (rather than her kitchen at home), bake cakes/cookies/pies regularly during the week, have more fridges so that she can stock and sell a much wider range of cheese and other deli items. Most importantly, the shop will be able to open more days each week, offering a much better service to the residents of the local villages and towns. A Planning Permission request was submitted at the end of June 2016, and Bedford Borough Council Planners responded at the end of September with a resounding YES! As the cabin has an 8 week lead time, Sue has decided that the build will go ahead in early January 2017. Can you help to fund the expansion? Every penny helps, if you can help, and to find out more about the project, and the latest news, please follow this link (LIVE UNTIL END OF JUNE 2017). Update: Sunday 28th May 2017. The initial round of fundraising meant that the cabin could be built (end of April 2017), and work has gone on during May to line the walls, floor and ceiling, and install washable surfaces all round. New lights have been installed, and electricity was connected this week. The Garden Centre have laid pipes and connections to mains water and mains waste which is fantastic. Jobs still to do include laying the concrete base for the gas bottle cage, purchasing the gas bottles and the oven, the installation of all that, and the installation of the sinks. Hopefully we will be up and running by the latter part of June. If you are able to donate any money (using the link above), it will be put towards the purchase of a large Serve Over fridge - so that a wider cheese selection can be displayed, and also other deli items such as olives, homemade pies, pasties etc. These fridges cost over £1000 so every penny donated will help towards the cost - Thank You! We now have running hot and cold water and a working oven! Many thanks to John from Meyrick Installations for all your hard work on the hottest day of this year! Still some things to be done, we are planning an Open Day on Saturday 15th July 2017, 2pm. All welcome. Thank you to everyone who came to the Opening! We had a very pleasant time with drinks, nibbles and plenty of chat. Here's the Wall of Fame.